I am one who often finds it hard to pass up on a good deal. Especially, when it comes to makeup sets. 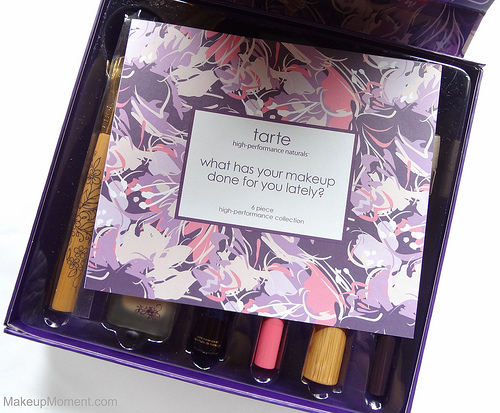 When I saw that Tarte had released their six piece high performance collection on QVC last week, I immediately jumped on the chance to order myself a set. QVC had a one day only $49.96 special price for this set, that made it even harder to resist. 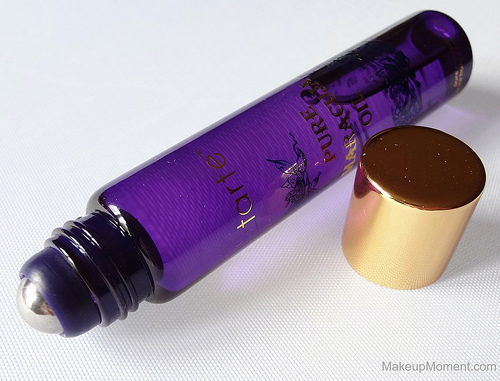 One of the things that I love about Tarte is that their products are cruelty free, and formulated without harsh ingredients like parabens, synthetic fragrances, and phthalates. 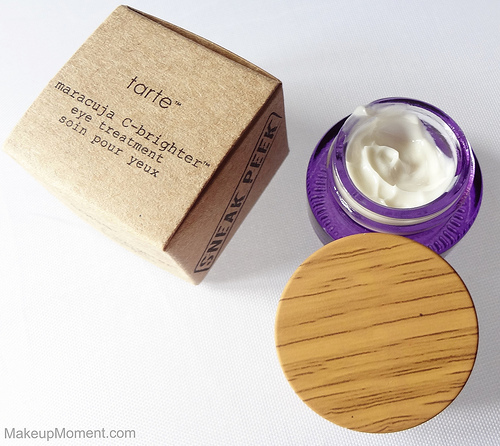 I have tried a few Tarte products in the past and, I really enjoyed them so, I think this kit is a nice way to try more of their beauty offerings, without the huge price tag. I just received this set a few days ago so, I haven't really had a proper chance to try out the items Stay tuned for upcoming reviews! These products do look promising, though. And the box? Adorable! 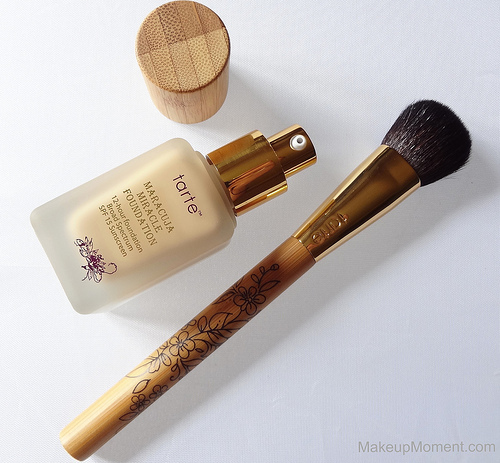 In the meantime, here are a few close up pictures and if you guys like Tarte cosmetics and want to try more of their products, I think this set is a nice one to look into. You are not only getting an awesome deal but, each of the items are infused with super ingredients that also benefit the skin. And who knows? you just might fall in love. 100% Pure Maracuja Oil Rollerball: Skincare oils have been all the rave in the beauty community, thanks to their ability to hydrate the skin. This rollerball can be applied anywhere on the face-even the under eye area. I am pretty excited to try this out and see what it can do for my skin. Maracuja Miracle Foundation + Application Brush: This foundation is one of the main reasons why I decided to purchase this set. I love trying foundations and this one promises a full coverage and a dewy, radiant finish. I got this foundation in the light shade. The pump dispenser is greatly appreciated and the accompanying brush is very soft and just gorgeous, to look at. I am super excited to give these a go! 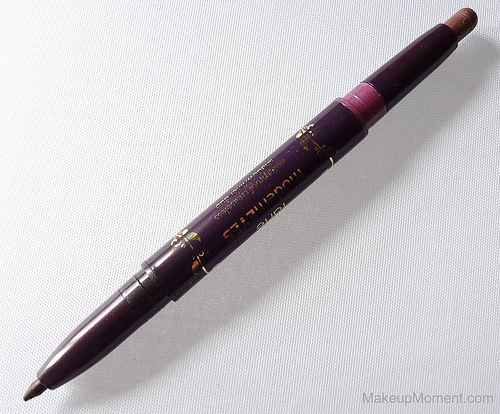 modernEYES Waterproof Creaseless Shadow/Liner in Plumberry/Plum Brown: I love black eyeliner and shadow as much as the next girl but, sometimes I prefer a softer eye look. And this plum duo is sure to do just that. The plumberry shadow is a stunning, golden shimmered mauve color, and the liner is a dark plum. Both feel very creamy and when I swatched them on the back of my hand, I rubbed and rubbed, and they did not budge! I have high hopes that these will last on my oily lids. 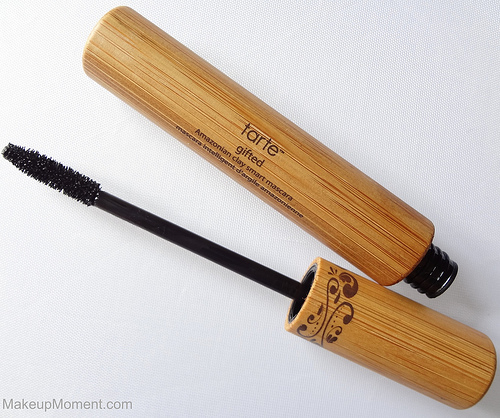 gifted Amazonian Clay Smart Mascara: I have to say, the bamboo mascara tube is pretty cool. It really does stand out among my other mascaras. Very different, and interesting. Can't wait to see what this mascara can do for my lashes. I am hoping that it will separate and lengthen them, nicely. LipSurgence Lip Shine in Smitten: The creamy soft pink coloring of this lip shine is right up my alley. I do think the cap is a bit odd and awkward but, it's something I have to deal with because it contains a handy built in sharpener. 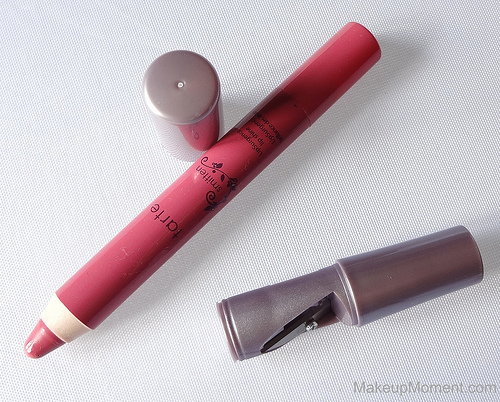 This lip shine doesn't have a twist up/down mechanism, like the original Tarte lip pencils do. Maracuja C-Brighter Eye Treatment: This new, bonus eye cream was a complete surprise to me! I love products that target the eye area and when I saw this eye cream included in the box, I jumped for joy. This eye cream helps diffuse and brighten dark circles, as well as diminish fine lines, with continued use. I have pretty bad dark, under eye circles so this product sounds like a treat. *You can purchase this collection over at QVC for $59. Get to it! 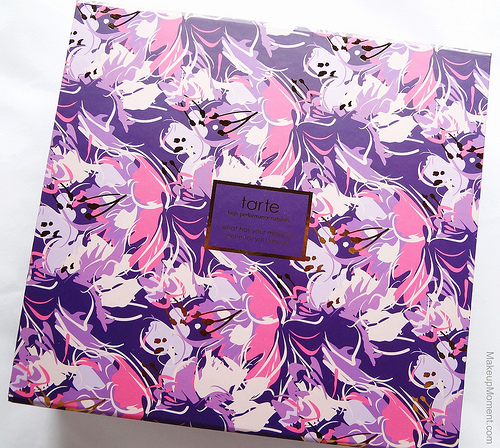 Did any of you pick up, or are thinking about purchasing this Tarte set? 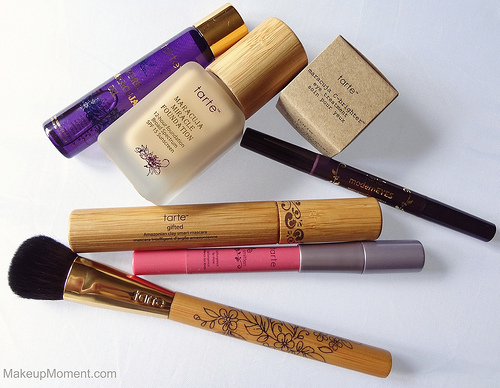 Which are your favorite Tarte products? I would like to get this but I need the foundation ti be darker. They have kits with other foundation shades as well, Jazmin :) If you look on the QVC website, there are more foundation colors to choose from. I am an NC25 in MAC foundations so light seems to be the best match for me. If you do end up getting this set, let me know how you like it! Tarte has such amazing products. Im dying to try out that roller ball! I've cut myself off from QVC lately. This isn't helping.